Oracle WebCenter Content: Records (formerly Universal Records Management) is enterprise software designed to help companies manage both physical and electronic records (invoices, purchase orders, spreadsheets, CAD drawings, etc.). In general, records management software helps companies control how long content of any kind must be kept before it is destroyed. True enterprise records management software has the capability to control both electronic content and physical records such as a box of documents stored in an offsite location and it has robust capabilities for specifying when and how to dispose of the content. Most companies excel at keeping content. In fact many companies simply “keep everything forever.” Since the amount of time to keep documents is often dictated by law and companies don’t have a tool to insure compliance across the organization, keeping everything forever quickly becomes the easiest and most often implemented “retention policy.” The challenges of categorizing the content, finding it when needed and disposing of it at the right time simply require too much effort. There may be different versions of the same document. Without some effort to dispose of an old version, mistakes are inevitable. Using a manufacturing company as an example, there may be assembly or installation instructions for a product. Perhaps the way a product is installed affects its safety or function. Perhaps an incorrect installation will fail to meet a specific government regulation. In these cases it is critical that only the most recent installation instructions are used. Failure to do so will result in a lawsuit and/or steep fines. Since Oracle WebCenter Content: Records is also an enterprise content management system, controlling and disposing of specific document versions is inherently simple. Saving everything forever can create significant storage cost. It takes money to pay for both physical and electronic storage. It takes money to pay for handling and management of the content items too. Each time a box of old invoices is moved, more money and time are invested to maintain its existence. Every square foot of storage space is purchased or leased, taxed and sometimes heated and cooled. Likewise, every byte of data is stored, backed up and maintained on a hard drive somewhere. Overall, there’s a larger than expected “hidden” cost associated with storing every piece of content the company owns regardless of whether the item is printed and stored in a file cabinet or whether it is stored electronically on a network. As the number of content items increase, the cost of carrying those items increases. Keeping everything forever guarantees that a company’s cost of content will increase perpetually. Oracle WebCenter Content: Records allows you to assign costs and invoice for storage of content to help keep this under control. Perhaps the best way to think about records management software is to compare it to back-up software that an IT department uses. Back-up software is used every day to make sure the company can recover its data after a disaster. Perhaps someone accidentally deleted important engineering documents or there was a physical hardware failure on the network. Maybe there was a massive tornado complete with flying cows. In any event, the back-up software is there to ensure that the company can restore the missing information and recover from the disaster. Similarly, records management software is used every day to ensure that content which must be kept for specific periods of time is indeed kept for that length of time. It ensures that correct content is used throughout the organization and perhaps most importantly, the records management software is responsible for ensuring that content is moved, approved for disposition by the correct people and eventually disposed of at the appropriate time. This ultimately helps the company recover in the event of a legal disaster. Just as back-up software helps an IT department deal with the inevitable accidental document deletion, records management software helps the legal department deal with the inevitable lawsuit. Surprisingly, while virtually every IT department uses some kind of back-up software, very few legal departments use records management software, yet the disasters that occur in the legal department are just as certain and can be far more costly. Oracle WebCenter Content: Records is designed to be an enterprise class records management system. The list of key features includes compliance with Department of Defense 5015.2 version 3, baseline records management, classified records management and the Freedom of Information Act and Privacy Act requirements specification. The software has hot-pluggable integration with Oracle WebCenter Content and pre-built adapters for Microsoft SharePoint 2007 & 2010, EMC Documentum, IBM File Net and popular network file systems such as Linux/Unix and Windows. The pre-built adapters provide a single point of interaction for electronic and physical records management to manage and enforce file plans, centralize legal holds, perform disposition processing and discovery and provide audit trails and disposition certificates. Oracle WebCenter Content: Records provides intuitive retention management and e-discovery capabilities that combine with a robust feature set to provide records managers with a single view into all retention schedules, disposition actions and audit histories. A proper implementation of Oracle WebCenter Content: Records software changes a legal discovery process from an expensive unpredictable nightmare to a well-defined and predictable business process. TEAM Informatics is an Oracle partner and recognized leader in the field of content management and records management using Oracle products. 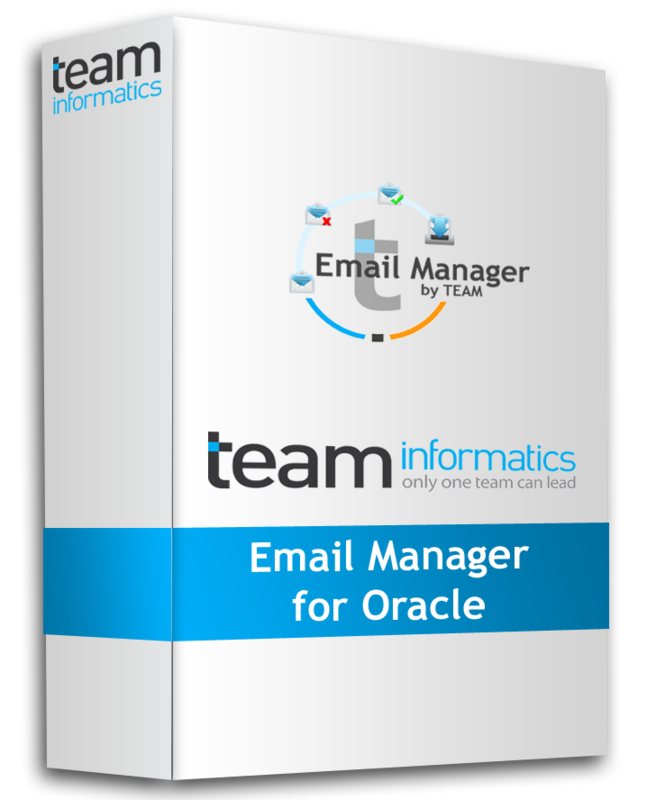 Our E-Mail Manager for Oracle was developed by the TEAM Informatics product development group and it extends the power and flexibility of Oracle records management to a company’s e-mail system. This incredibly useful tool allows records managers to perform e-discovery over the entire corporation including the massive volume of e-mail which is accumulated by businesses today. Records managers who include the E-Mail Manager for Oracle in their suite of tools enjoy a single interface for managing e-Discovery across the entire organization. Read the press release. If your company is like most, you will quickly admit that there is a records management problem but you’re probably not clear on a solution to fix it. Your company may want records management software but everyone is simply too busy running the daily business of producing widgets or providing services to take on yet another project. Even if the company did want to implement a new records management software system, there may not be internal resources with the unique set of records management, project management and software implementation skills necessary to successfully implement a solution. This is where TEAM Informatics can help. TEAM Informatics is a recognized leader with Oracle WebCenter Content: Records implementations. Whether your company has a project team in place and simply needs a subject matter expert for a few days, or your company needs a highly functional external team to come in and move your entire records management implementation forward, TEAM Informatics has the experience, expertise and resources to make records management successful at your company. This entry was posted on Tuesday, May 1st, 2012 at 1:44 pm and is filed under Oracle, Records, WebCenter Content. You can follow any responses to this entry through the RSS 2.0 feed. You can leave a response, or trackback from your own site.